For a holiday villa in Europe (and, some in Florida too) you can't go too far wrong looking at "James Villas". We've got the latest villas for week ending 19th March 2014, from James Villas on this here page. With villas from a wide range of places, including: Epirus, Cyprus, Sardinia, Algarve, Costa del Sol, Lisbon Coast, Gozo, Corfu, Kefalonia, Zakynthos, Crete, Amalfi Coast, Ibiza, Costa Dorada, Mallorca, Lanzarote, Gran Canaria, Menorca and Tenerife. You can see all the latest villas below, but before you nip off there, let me mention a couple of villas specifically: "Villa Alexsandra" and "Villa Ariadne"
The first villa is Alexsandra in Sivota, Epirus. Sleeping 8 people, this larger villa has some great views across the Ionian Sea. A lovely place to explore some of the magical history which Greece provides - this is also a good place to spend some time by the sea! 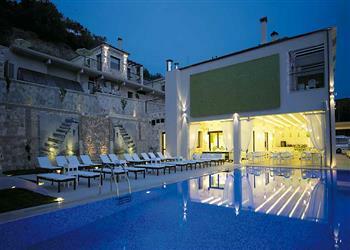 Also in the Epirus region of Greece, we have Ariadne in Parga. Situated a few miles south of Alexsandra, villa Ariadne sleeps 4 people. Located in the grounds of a boutique hotel, Ariadne has its own private pool - and use of the hotel's facilities. Both of these holiday villas have the benefit of a private swimming pool too - so you don't have to go far for a little swim. If you can't find anything here, you can always look at the very latest holiday villas available with James Villas.